With Jay Cutler wanting out, could Chris Simms be the Broncos' next starting QB? The s-word is hitting the proverbial fan in Denver and it could be good news for former Longhorn QB [tag]Chris Simms[/tag]. Broncos starting quarterback Jay Cutler has had his feelings hurt and is making it known to anyone who will listen that he wants to be traded. Simms, who signed with the Broncos earlier this month, was in line to be the number two guy but could now be the opening week starter if Cutler gets his wish. Denver will likely look for a QB in the trade or via the draft, but Simms would likely have the first shot at the starting job. The 2005 recruiting season was an up and down one for the Texas Longhorns full of hits and big misses. Nothing had a bigger impact on the future of Texas football than the roller coaster ride that was Ryan Perrilloux. Perrilloux eventually decommitted (after months of lies) leaving the Horns with only a unheralded 3-star QB named [tag]Colt McCoy[/tag]. Guess that turned out alright after all. Texas offensive coordinator and quarterbacks coach Greg Davis says most talent evaluators put too much emphasis on a quarterback’s arm strength. Several years ago, while coaching in the East-West Shrine Game in San Francisco, Davis got to sit with 49ers legend Bill Walsh at a dinner. He asked Walsh the most important qualities he had identified in the many successful QBs he drafted. Davis knows well the importance of digging beyond the recruiting rankings. During his and head coach Mack Brown’s 11-year tenure in Austin, the Longhorns have signed two QBs who were No. 1 in their class — [tag]Chris Simms[/tag] (1999) and [tag]Vince Young[/tag] (2002) — and originally received a commitment from Perrilloux. However, they found their current star quarterback — three-year starter and 2008 Heisman runner-up Colt McCoy — tucked away at a small school in rural Tuscola, Texas. In the ’05 class, McCoy — then listed at 6-foot-1, 180 pounds — was ranked just 15th among pro-style QBs, behind Pittsburgh’s Bill Stull, Notre Dame’s Evan Sharpley and Wisconsin’s Dustin Sherer, among others. The Tennessean is reporting that former Horn [tag]Chris Simms[/tag] has signed with the Titans to backup Kerry Collins and the currently injured [tag]Vince Young[/tag]. With Titans quarterback Vince Young out indefinitely, the Titans on Tuesday began firming up their back-up plans. Those plans include veteran Chris Simms, not former Montgomery Bell Academy star Ingle Martin. MRI results on Tuesday confirmed Young, injured in Sunday’s win over the Jaguars, has a left MCL sprain. While the team had no timetable for his return, early indications are it could keep him out anywhere from 2-4 weeks. But there were also indications the team might be prepared to let Kerry Collins lead the way if the team is playing well even when Young returns. On Tuesday, the Titans agreed to terms with Simms, who will serve as Collins’ back-up starting with Sunday’s game at Cincinnati. Simms, a 28-year-old left-handed free agent, is expected to be on the field for the Titans on Wednesday, a day after the team auditioned three veteran quarterbacks and let Martin go to the Chiefs. Simms will back up Collins for now and I assume compete to be the number two guy when Vince returns. If Vince’s injury is more serious there is a chance he could beat out Collins some time later in the season. Collins has been really average so if Simms is healthy he’s certainly a better long term solution. Vince Young injury serious? Chris Simms to Patriots or Titans? Cedric Benson to Texans or Saints? Comments Off on Vince Young injury serious? 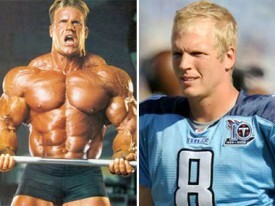 Chris Simms to Patriots or Titans? Cedric Benson to Texans or Saints? Schefter is reporting that the Titans think [tag]Vince Young[/tag] tore his MCL. I am not really sure what that means. He is expected to have an MRI tomorrow. We will just have to wait and see what the MRI reveals. Now it gets interesting. PFT is reporting that the Titans have contacted Chris Simms. If the Titans don’t have confidence that Ingle Martin, who is on the practice squad, can step in if Kerry Collins were to go down, they absolutely have to bring in another quarterback. Simms is probably the best guy available, but I would also put a call in to Daunte Culpepper to see how serious he is about retirement. The Patriots are resigned to the fact that Brady likely suffered a torn anterior cruciate ligament and perhaps other damage in his left knee during today’s game against the Kansas City Chiefs, said the source, who spoke on the condition of anonymity because he was not authorized to discuss Brady’s condition publicly. Brady exited the game after taking a hit to the knee and was replaced by backup Matt Cassel. Free agent quarterback [tag]Chris Simms[/tag], released by the Tampa Bay Buccaneers in their final round of roster cuts, is scheduled to work out for the Patriots on Monday and could be signed by day’s end. The Patriots also could consider free agent Tim Rattay, a source said. Former Bears running back [tag]Cedric Benson[/tag], released by the team June 9 after two alcohol-related off-season arrests, said Saturday he has a tryout with the Houston Texans this week. Benson also said by phone he’d had a workout with the New Orleans Saints two weeks ago and that it “went well.” Benson believes teams are waiting for his legal matters to be cleared up before signing him. Chris Simms next Cowboys’ backup quarterback? While Brett Favre’s future team has most of the nation enthralled this week, former Longhorn quarterback [tag]Chris Simms[/tag] may also soon have a new home. He’s currently being held hostage in Tampa Bay but the Bucs appear to finally be open to finding Chris a new team. It sounds like if the team gets the right offer he could be on the move soon. ESPN reported yesterday that the Dallas Cowboys have been interested in Simms for a while and inquired back in May about his availability. At the time the Bucs were asking for a 4th round pick in return but as the season has approached the asking price has come down and the Cowboys’ interest has renewed. Simms would be Tony Romo’s backup in Dallas if acquired. Current backup Brad Johnson is 40 years old and reportedly struggling mightily in training camp this week. Dallas appears to be a good temporary destination for Chris, though he’d have better long term opportunities with some other interested teams including the Chicago Bears. Romo will be Dallas’ starter for the foreseeable future but Chris could compete for a starting job right away in Chicago. No matter where he ends up he’ll be better off then he is now, so hopefully a deal gets done soon. A crossroads season for Horns QBs past and present. Simms, Young, Snead, and McCoy all face important seasons. Former Longhorn quarterback [tag]Chris Simms[/tag] is finally speaking up about what is happening to him in Tampa Bay. In an interview with the St. Petersburg Times Chris spoke bluntly about his differences with head coach Jon Gruden and believes he won’t be with the team in 2008. Chris Simms says his relationship with Jon Gruden is beyond repair and has been told he will not be with the team in 2008. But with no trade on the horizon, the Bucs’ forgotten quarterback wants to be released immediately, bringing an end to his career in Tampa Bay that seemed inevitable after missing nearly two seasons following surgery to remove his spleen. It’s definitely not a money issue for Chris, he just wants to be given a chance to play. He feels the Bucs mishandled his injury situation and despite trade opportunities have held onto him without any intention of playing him. Simms is still in the prime of his career and the season before his spleen injury had a lot of people around the league excited about his potential, hopefully he gets a chance to show what he’s capable of somewhere. Peter King discusses Chris Simms‘ situation with the Bucs in his latest mailbag. They need to either trade him or cut him.